Providing stylish and professional Photo Booths for corporate events, weddings, private parties, company functions, children’s parties, bars and nightclubs throughout Cork. Capture all the fun of your party or wedding, and give your guests a memento of the special day, when you choose a Photo Booth from Ted Dunne Entertainment. All our booths are sleek and modern, using state of the art cameras and printers, and every booking includes a professionally trained attendant as standard. 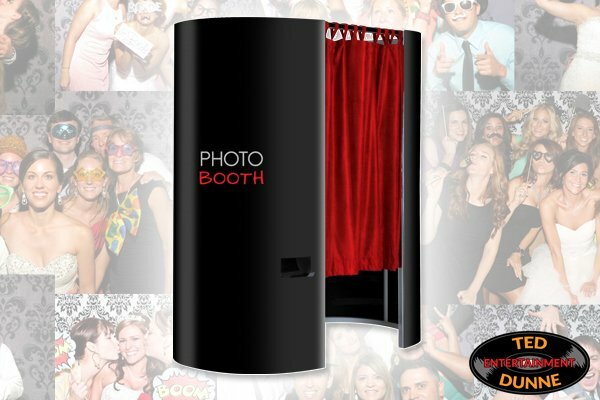 A Photo Booth at your event is a fantastic way to entertain your guests, get people together and have fun. Whether it be family and friends enjoying a wedding reception, or colleagues at a work party, or a group of laughing friends celebrating a birthday, a photo booth captures truly unique moments to treasure long after your event. Our photo booths incorporate high quality digital cameras and the latest in photo image printing technology to ensure the very best prints for you and your guests. We proudly focus on both attentive customer service, as well as quality photos, ensuring that you and your guests have a pleasant experience with us throughout. To check availability and fees for a Photo Booth for your wedding or event, simply complete the form below, and we will be in touch with a custom quote within 24 hours.